Moscow, April 10, Interfax - Ravil Gainutdin, the head of Russian Council of Muftis, has offered condolences on the terrorist attacks in churches in the Egyptian cities of Tanta and Alexandria. 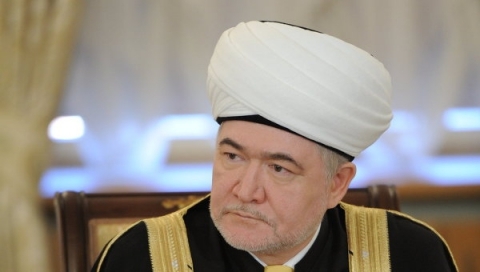 Photo: Ravil Gainutdin, the head of Russian Council of Muftis. “We are deeply outraged by what has occurred and we emphasize that such actions against civilians are unacceptable and prohibited from the point of view of Islam,” the mufti was quoted by the Muslim Board press service as saying on Monday. Russia’s Muslims pray for the speedy recovery of the injured and for peace and security in Egypt, he said. Two attacks on Christian churches took place in Egypt on Sunday. The explosion in the church of the city of Tanta killed, according to various information, from 25 to 30 people and over 50 were injured. In Alexandria, an explosion occurred at the entrance to the St. Mark Cathedral, at least 11 people were killed. According to information possessed by the police, both explosions were carried out by suicide bombers. The terrorist group Islamic State (banned in Russia) has claimed responsibility for the attacks. Some nine million Christians, primarily Coptic, live in Egypt. They have been victim of terrorist attacks before. In December 2016, a suicide bomber carried out an explosion on the territory of the Coptic Cathedral of St. Mark in Cairo. Responsibility for the terrorist attack, in which dozens of people were killed and wounded, was also claimed by the Islamic State.